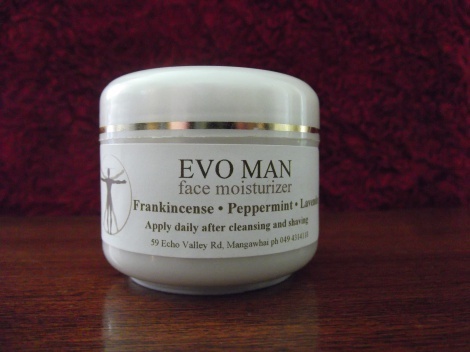 EVOMAN face moisturiser is made with our EVO extra virgin olive oil beeswax and witch hazel make up the base. Therapeutic essential oils of frankincense peppermint and lavender are added. Frankincense heals wrinkles peppermint clears sinus headaches and heals skin irritations lavender regenerates skin. Use in the morning after shaving and at night for a good restful nights sleep. The EVOMAN face moisturiser appeals to the men and they particularly like its aroma. Use EVOMAN face moisturiser twice a day in the morning when shaving and at night after cleansing. Use EVOMAN shave & cleanse oil and EVOMAN face moisturiser twice daily to STOP SNORING and CLEAR SINUS.